1. Dry emboss a piece of light colored cardstock with an embossing folder. 2. Color the textured area with markers, Copics, watercolors, Gelatos, pencils, or any other medium you choose. 3. Do not put your color on the folder and then emboss....that is a different technique. 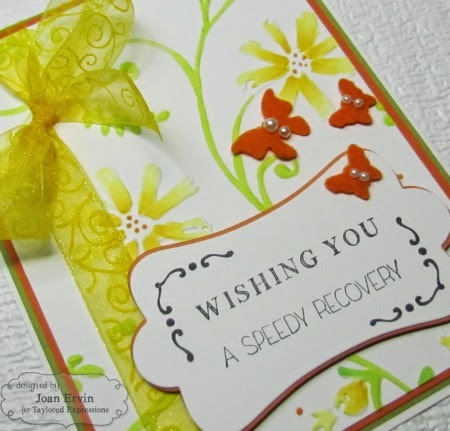 My card was embossed with a flower Cuttlebug folder and colored with Spectrum Noir markers. The sentiment layers were cutout with the Label Stacklets 3 die from Taylored Expressions and the sentiments are from the TE Chalkboard Elements set. The butterflies were cut from Taylored Expressions orange felt with the TE In Flight Overlays dies. The pearls and ribbon finish it off. Thanks for stopping by....have a great day and I hope you can join us for this week's TLC challenge!!! This came out beautiful Joan. I have this embossing folder, must give this a try :). I'm going to make time to give this a try today, Joan! There is so much fun to be had with embossing folders and this is another great technique to throw into the mix! Your card is gorgeous! We'll see what I end up with! oh my this is stunning.. i love it..
so beautiful! i have that embossing folder. i may need to try that- it's gorgeous. So beautiful and love those spring time (summer) colors! Loving all the yellow on this. Your 4th sounds about like what ours was too! Have fun with the grands. glad you had a nice relaxing holiday weekend! Beautiful card!! Have fun with the grands!!! I spent the 4th with my new grand! Beautiful card that would perk anyone up. 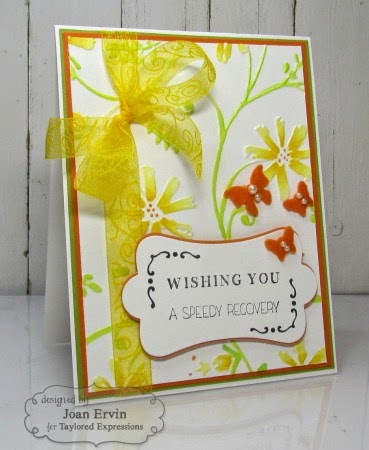 Beautiful card and beautiful colors! Thanks for reminding me of this great technique! Your card is beautiful! !